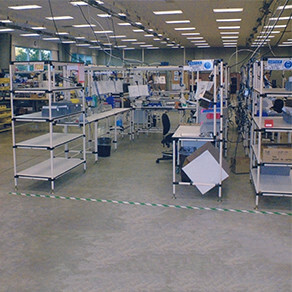 U or L-shaped Platforms in Cells eliminate wasted space promoting swift movement from station to station without excessive steps and minimizing reach distances. 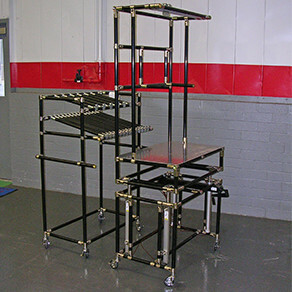 ESD Workstation/Flow Rack built with ESD pipe, nickel plated joints and ESD casters have hydraulic lift assist work surface and mobile flow rack for easy restocking for static sensitive product assembly. 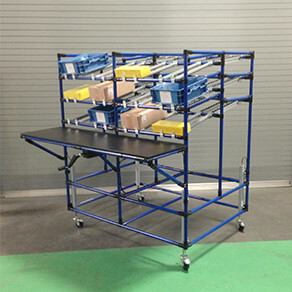 Heavy-duty Workstation built with 42mm pipe & joints for strength without bracing has hydraulic height adjustable work surface, electronic order picking, convenient part retrieval and tool storage. 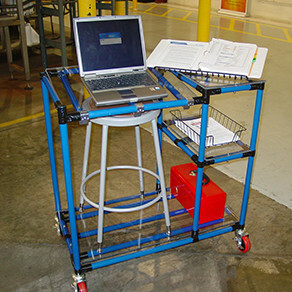 Mobile Laptop Computer Station provides secure workspace for the laptop that ergonomically positions laptops at a comfortable work height plus storage for records and supplies. 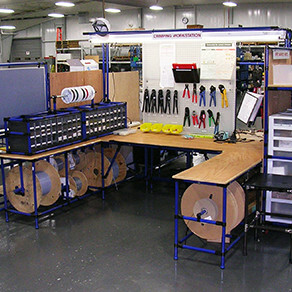 Shipping Department Workstation has adjustable work surface, compartments for box storage, roller/slide conveyor lanes and storage shelves for completed packages. 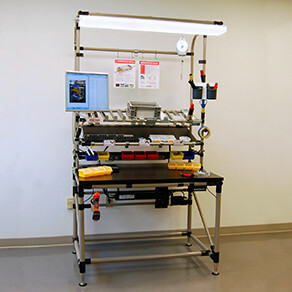 Stand-Up Workstation for fulfilling orders of packaged parts in cell or shipping department accommodates two associates and supplies while also providing expandability. 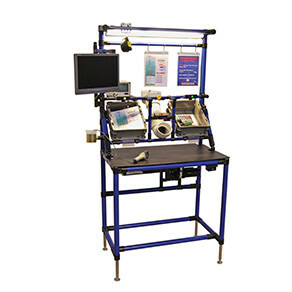 Heavy-duty Workstation built with 42mm pipe & joints has 1″ thick ergo lift work surface, easy access to stored items, computer keyboard and monitor, Placon roller conveyor parts feed and tool storage. 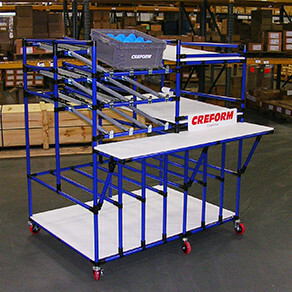 Mobile Production Workstation has ergo lift height adjustable work surface plus four conveyor flow lanes for handling varying sized totes and boxes within easy reach of operators. 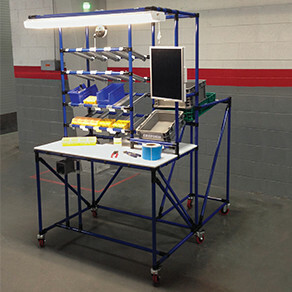 Portable 42mm heavy-duty Workstation provides temporary, in-plant work surface, fits through most commercial doors and has tool and parts storage with simple flow racks and overhead light. 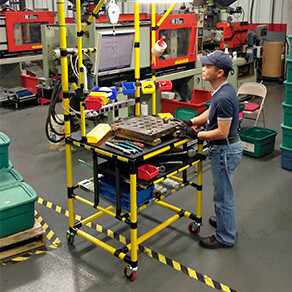 U-Cell Workstation provides sit-down ergonomics, everything within easy reach and the ability to make modifications and additions when needs change. 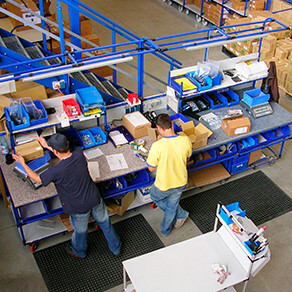 Workstation with conveyors is easily serviced by material handlers and combines multiple assembly operations into single units eliminating unnecessary steps for assemblers.